Nature and Man: Hazards, Earthquake & Nuclear energy! Even if Fukushima has left the front page of the news, the situation is still very serious. Here you will find an estimate of land contamination around the plant (in French). A 20 Km zone and a 30-40 Km north-west extension will have to be evacuated for some time. Here and here (English) you will find assessment of the situation in reactors cores. Apparently, core 1 has undergone almost total fusion. They have a barge to "store" 10,000 tons of radioactively contaminated water but they already have that to get rid of! also a floating radioactive waste ship is a ticking time bomb in itself, given the chances of more accidents! At last they seem top be using robots to clear debris. Fukushima left the front news, but the situation is still quite serious. The IAEA issued another press release: http://www.iaea.org/newscenter/news/tsunamiupdate01.html and they sent some experts in Japan on a facts-finding mission last week: http://www.iaea.org/newscenter/news/2011/japanmission.html. They even put some travel photos on flickr: http://www.flickr.com/photos/iaea_imagebank/sets/72157626815913418/. The French site I cited a few times in this thread now has an English version: http://www.irsn.fr/EN/Pages/home.aspx. The documents on radioactive fall-out are well written and worth a read. I do not know if it is OK to link this, but on MetaFilter is an ongoing discussion about the implication of organized crime in the functioning of the Tepco cleanup efforts. There are some interesting links in the discussion, I just want to highlight Safecast as a crowd-sourced radiation monitoring effort. The Fukushima Project is another crowd sourced approach to gather all news on the disaster and to provide the links to the original sources. clean up is showing signs of tackling the scores of ships and boats stranded on land. There's a nice video from BBC News, here. All along the coast, stranded ships are being moved with massive cranes, mammoth multi-wheeled flat bed trucks and special steel roadways to the sea. A lot of rubble has been cleared but the question is this, will people come back to the place of nightmares and impossible loss to rebuild their homes and lives on the empty barren and haunted landscape? Seeing these ships being moved like toys is awe-inspiring and frightening. The reconstruction of the towns along the coast will hopefully be done with the warnings of the ancestors in mind or protected by a sufficiently high wall. What Fukushima can teach us about coal pollution (from boingboing). In the long term, Tepco studies how to encapsulate the reactors. A camp has been installed on the spot for local workers. There are still 100 000 to 120 000 metric tons of contaminated water needing to be treated on the spot. Old news but still news: concerns of fission at unit 2 reported in the press today. According to this report, the concerns may be due to a mistranslation. It is not clear whether fission has resumed or not. Tepco is injecting boring acid into the reactor vessel. If the radioactive Xenon is indeed being detected, then fission is occurring. They have to extract, somehow the melted material if they are going to have a cold shutdown. The Boric acid can attenuate the situation by blocking radiation feeding the fission reactions but it's not yet safe. We have just had an accidental release of non-radioactive ammonia in a California Nuclear plant. The fact that anything toxic is released is worrisome for nuclear safety as a whole. It is not in the front page any more, but I am still following the accident's consequences. Are you? Here is an interesting study on dispersion of isotopes in the pacific ocean. But, basically, it only proves what we already knew: the pacific ocean is large. What has not been presented yet is the affect that climbs up the food chain to larger fish. So the longer lived isotopes such as Cs137 could build up. It could vary greatly as to where small fish, like sardines feed and where large fish consume them. It's great that folk are studying these effects. It should give pause to restarting the nuclear plants in Japan. To me at least, all plants should shut down safely under every emergency we can think of where we could still live on planet earth. For sure earthquakes can be modeled. no plant should need electricity to cold shut down automatically and even if there's a leak, there should be automatic mechanical solutions. As long as population expansion continues, we need more energy. Nuclear power generation is a great idea, but just like nuclear bombs, it cannot be left to the for-profit ownership of corporations, (who seem to have lobotomized asocial bean counters), to ensure our safety. 50 years time we'll have essentially artificial trees to give us hydrogen, oxygen and electricity generated locally throughout the planet. In the meantime, nuclear plants should come under more responsible control. According to the BBC and other news services, an animal appearing to be a rat was responsible for a major electricity shut down to the cooling system, for spent fuel at the Fukishima nuclear facility this week. "The plant was brought under control in December 2011 and Monday's crisis was the first time since then that so many facilities had been affected by electrical failure at the same time, Tepco admits. The system cooling water which contained spent - but still highly radioactive - nuclear fuel rods failed and it took engineers some 30 hours to repair the damage." So how stupid is man that in one of the most technically advanced nation on the planet, we can't even stop a single humble rat from placing humans in grave jeopardy? Can't we do anything right or are we not competent to handle the awesome power we have harnessed unto ourselves! I pray the Iranians and N. Koreans are far better at this than the Japanese! That's funny. 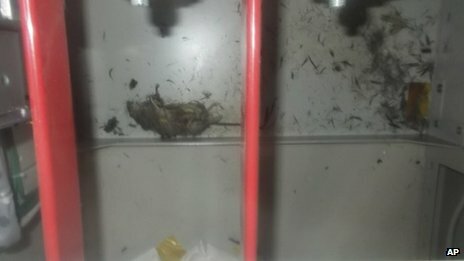 Just last week I lost all power and when the pwer company traced the line back, they found the sparse, very fried remains of a family of rats at the base of the pole (I have an underground feed). Little buggers gnawed at the rubberized casing on the main feed wire until one of them said to the others, "Hey guys, watch this." I shouldn't make light of the situation this rat could have been responsible for and do pray all countries with nuclear capability can do better than this. So how stupid is man that in one of the most technically advanced nation on the planet, we can't even stop a single humble rat from placing humans in grave jeopardy? Can't we do anything right or are we not competent to handle the awesome power we have harnessed unto ourselves! Let me tell you an open secret: no large scale industrial operation is safe. Each and everyone of them experiences this kind of disruption regularly. This is true, but large scale industrial operations should be and are made in away that such disruptions do not produce a safety hazard - at least when these operations are controlled by governmental bodies of nations where work safety and reasonable general safety rules are present and enforced. Recent accidents may prove me wrong in some cases, but in many cases fraud and the failure to follow safety procedures were the reason for the accident. The point is, that a foreseeable fault shall not lead to disaster. The installation must fail safe. What is a foreseeable fault and if you only aim for single faults or if double faults have to be covered as well depends on the degree of safety you want to have. Is a failure of a nuclear reactor like the ones seen a risk that can be taken on a base of one meltdown every 25 years or even less with an increasing number of installations? What additional cost is required to increase safety? Where is the point where the safety costs so much that the profitability of such an installation is in danger? What is valued higher - human life or profit? I don't think that we found the right balance here. I ask these questions on a purely logical base - each accident produces a loss of usable land for quite a long time notwithstanding the consequences of radioactive material in the environment and food chain. This is what we should expect if no drastic changes are made. We need to deal with multiple risks such as demonstrated in the Fukishuma tragedy. Earthquakes and tsunamis are relatively common events, but there's no excuse for bad planning such as bypassing protective sea walls, locating pumps below ground level and have a design of a plant that depends on anything by gravity to have a safe shut down. Plants need to have new guidelines for all systems so that the best international experts can provide the highest safety. Right now, in almost any plant in the USA, there are dozens of different versions for any valve or meter or other device, so it's harder to track faults and make safe repairs. In the reports of the Nuclear regulatory bodies here, there are daily infractions to safety rules and upkeep. Often the company is given time and then more time for things that don't meet standards. In fact, the nuclear Regulatory Commission is more of a friendly colleague than a task master and allow a very tolerant attitude to patch ups. The losses to Japan and Russia far exceeded any extra design costs to deal with the factor mentioned above. Nuclear energy is a major potential solution, but like anesthesia, has to be run by ethical people, not the profit motive. Energy ought to be national state ventures and used to subsidize that nations industries, so that their economies can be energy-independent. That way the nuclear industry would be run for the good of the country. There is a place for private enterprise, as long as there's powerful and independent external planning, implementation and monitoring over safety designs and practice. So it would be something like running a major teaching hospital. It could make a profit, but every part of the operation has to meet standards of efficacy and safety. Being a member of the external safety monitoring force, should be through a career track of a University degree and should exclude from hire anyone with connections to the very industry they have the responsibility to control. Right now, especially in Japan, there's often the opportunity for transfer back and forwards between companies and the agencies that are supposed to watch over them. This conflict of interest erodes the critical edge of decision makers. It's as if executives and policemen are in the same fraternity and people don't to protect each other. I do feel that we can have safe nuclear reactors, but not by commercial companies in bed with the regulators and not using the current lassoer-faire attitudes. Still, there's a more fundamental issue we need to address. Facing the realities of human growth and human waste is the key to tackling this madness. How do we do this when 8-10 children is considered the right, need and religious duty of so many cultures. We can't have logarithmic growth and not damage our living spaces. It may not be P.C. to state this bluntly, but as long as people believe that the demands consequent on unrestrained population growth will be solved by God, man will take no responsibility and just look for the profits to be made. As long as this question cannot be answered in a satisfying way, any safe nuclear reactor technology is moot. I did not mention Hanford as example, but now I did.Kyshtym or Tomsk should be mentioned for the sake of completeness. Negawatt - did you hear of this word? Do you know what it means? Factor 4 or better Factor 10 should be known to you. Population growth is a problem that can be countered at least partially by education and conditions that reduce the need of such a big family (this does not work for all cases, but for many) - think rent. I've heard it said that the French have technology that reduces the bulk of radioactive waster manyfold. I must check up on that. and many more, no doubt, that were hidden from the public! Thanks for the education. I've printed out some key articles and will then be up to speed on this new subject for me. Even an old dog can learn new tricks, LOL! The religious drives to, "Be fruitful and multiply!" are the most significant, as they are more resistant to change. For that reason and in the absence of massive re-education and wealth distribution, countries like Bangladesh, India, Indonesia and the entire South American continent will continue to grow out of resources and clean environment. Fundamental to this is a change of doctrine by religious orders. The new Pope has already indicated that this is very unlikely in his tenure! Rent? what are you suggesting, upping the rent if they have more children? They don't pay rent for mud huts and tin shanties, LOL. Or did you mean different, as in "Think different!"? Energy efficiency of the machines and equipment we use. Diversification of energy sources (you name whatever kind of energy source that is appropriate at the geographical location). Why not using more efficiency and a greater diversity of energy sources? This is still SF, but maybe Asimov hat the right answer in his novel 'The last question'. I could provide some material for this. What continues to amaze me is not only the incompetence of the Japanese company TEPCO, but more so of an inept government and submissive society that tolerates such continuous epic failures. Now the Japanese Nuclear Regulatory authority has stated that the massive passage of highly radioactive contaminated groundwater to the ocean has reached emergency levels. When will the Japanese people severe the bonds of deference and respect to stand up for accountability and public safety? If TEPCO was reported to be dropping puppies into the radioactive mess, then there would be riots no doubt, but threaten fishing grounds and more with disaster, is hardly a reason to rise up in anger! The wonder of the 20th century discovery of nuclear energy for peaceful purposes should have allowed progress of mankind. That was its promise! However, such immense power enclosed in ordinary industrial strength containers with ordinary safety mechanisms was the risky process of implementation. In making automobiles and consumer electronics, low failure rates allowed burgeoning success. Everything was made, "Good enough" to keep the supply chains going and customers happy. The rare occurrences of failure can be contained by simple replacement. So a Sony TV fails in Iowa City Iowa, or a crankshaft of a Honda cracks in Birmingham England and they'll be simply swopped out. Unfortunately, that same mentality was applied to components in nuclear reactors. That was the hubris from an over-confident nation that has not digested and assimilated previous national mistakes in handling immense power. (The same attitude permeates much of the nuclear industry worldwide with multiple sources and standards of meters, valves, pipes and backup systems that cannot be relied on). What followed in Fukushima was a cascade of incompetence: design, execution, maintenance and supervision that allowed this disaster to occur. Supervision and self-criticism and accepting no compromises are the essential elements missing in the attitude of the much of the worlds nuclear energy community. The Japanese Nuclear energy authorities have their own refined version of this pervasive and dangerous incompetence. To add to the usual nuclear energy lack of self-discipline and excellence, they had an inbred, respectful, congenial and casual supervision of the risk-taking companies in their charge. We've waited for insight to arrive at the political leadership in Japan. Now, at last, perhaps, Japan has at woken up to this reality: the sea water is being dangerously contaminated! The solution seems to come out of a science fiction movie, like traction beams to move meteors or else neutron bombs to slay gargantuan reptiles on the march to Tokyo. But we're here, at the desperate point of existential failure for ecosystems near to Japan. So they'll race around the clock to build an immense icewall to freeze the ground between the ocean and the ground-water. Good luck!! I read about this solution this morning on Rueters. At first it seems to be something out of science fiction. In fact freezing ground water is a method that has been used for sometime. I became aware of it probably 20 years ago when the Sifto Salt Mine in Goderich Ontario Canada - hired a water well drilling company (the company is owned by my wife Anne's family) to drill a series of deep wells in a large circle - - - where brinewater lines were inserted so that all of the ground water would be frozen off, to allow for the main vertical mine shaft to be drilled out and built in the center of the ring. It worked for that application. It's an interesting concept. What environmental issues that it will create is another issue. Whether it will work on the scale that Fukushima is considering - - - who knows. Humans continue to create massive environmental problems that are increasingly difficult to recover from - for sure. This is a great reference to the challenges facing TEPCO, university research teams and the Japanese Government. Essentially what they have to do is to be able to repair the leaking reactors by robots and remove the rods/melted core to safety and within the possibility of human control. Robots that can work in such inhospitable places are needed in natural disasters too, where risks to first responders are beyond human capabilities and reach. Also we have many more nuclear reactors waiting for their own disasters. These devices should have been imagined and built before the reactors! Still, their immediate necessity and the certainty that they will be built no matter the cost, adds considerable remedy to a unconscionable situation. Yes, robots are required, but this kind of environment is a challenge for robots as well. The radiation causes electronics to malfunction. Fortune March 20th this year. This kind of challenge puts the bar very high - even for robots. Hope that the development of new types of robots will catch up. In Chernobyl, robots were not that good, so Liquidators did the work. Well, we are learning more about hardening of electronics to radiation degradation. That's a deadly serious research track for military satellite MFR. decommissioning, hazard mitigation and decontamination work done. Actually, with about 600,000 workers, they did a brilliant job organizing everyone so no one got a lethal dose! Very few deaths due to radiation so far! I would hope though, that we have advanced in building robots with shielding!